International cricket returned to Pakistan for the first time in 9 years, as the Windies answered the call to play three T20’s in Karachi, a city known for its rich cricketing history and heritage. For the past 9 years, Pakistan have played all their home series in the United Arab Emirates, following the 2009 terrorist attack on a Sri Lankan team bus which left several players injured and members of the security forces dead. It was no surprise then that a capacity crowd greeted both teams for the first encounter at the Karachi Stadium. The Windies, led by Trinidadian Jason Mohammed, elected to field after winning the toss. However, it was a decision the visitors would regret, as the host equaled their highest T20 score of 203 for 5. 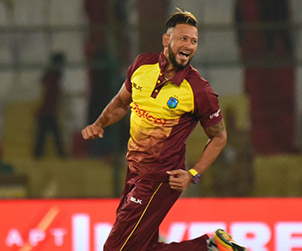 Debutant Hussain Talat top-scored with 41 and Shoaib Malik was left unbeaten on 37, while Keemo Paul was the pick of the Windies bowlers with 1-26. 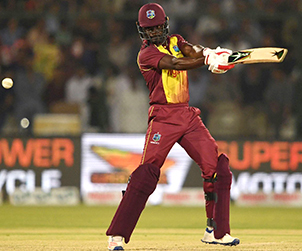 Set 204 to win, the Windies faltered in the run chase, losing wickets at regular intervals. They were eventually dismissed for a mere 60 runs, their lowest T20I score and the largest margin of defeat between two full members, 143 runs. Confidence was high amongst the host team, who have won 16 of their last 19 T20 matches. Much was expected from the visitors in the second game, after they handed young Jamaican bowling all-rounder Odean Smith his debut, however the home team were keen to wrap up the series to the delight of their adorning fans. This time the Pakistanis elected to take first strike after winning the toss, and they would bat even better than game one, racking up 205 for 3. That total was their highest T20 International score, as the inform Babar Azam was left unbeaten on 97, while the youngster Talat was also amongst the runs, scoring 63. Smith gave a good account of himself amongst his more senior counterparts, picking up 1 for 40 from his four overs. 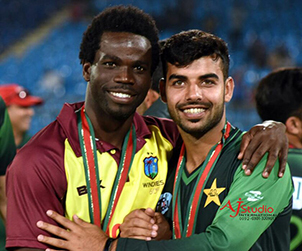 There was a wicket a piece also for Rayad Emrit and Kesrick Williams. 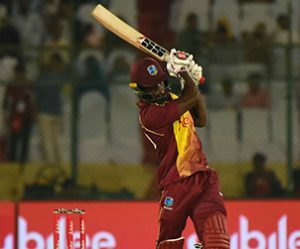 Chasing the improbable total of 206 to win, the Windies faired a bit better with the bat, as opener Chadwick Walton stroked 40 from 29 balls, however that was the only significant score for the visitors, as wickets again fell regularly. 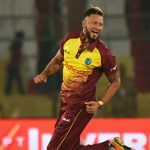 Eventually, the Windies were bowled out for 123 in 19.2 overs to hand Pakistan victory by 82 runs. Left arm seamer Mohammed Amir was the main destroyer, bagging 3 for 22. With the series already lost, the Windies handed debut to another of their youngsters, batsman Andre McCarthy, in the third and final game. Captain Mohammed decided to bat first after winning the toss, and the Windies looked to have found the formula, putting up 153 for 6 in their 20 overs. Despite losing Chadwick Walton early, opener Andre Fletcher and Marlon Samuels spruced up the scoring with Fletcher racking up his 6th T20 half-century 52 from 43 balls. Samuels chipped in with 31, but the Windies total was largely dependent on wicket-keeper batsman Denesh Ramdin who was not out on a solid 42 from 18 balls. Set 154 to win, the Pakistani batsmen continued in their rich vein of form, as Babar Azam’s 51 and Fakhar Zaman’s 40 carried them home for the loss of two wickets with 19 balls to spare to complete a 3-0 sweep. Azam finished the top run scorer in the series with 165 runs from three innings, including a not out. Hussain Talat was second with 135 runs. Denesh Ramdin was the top run scorer for the Windies with 63 runs from three innings. 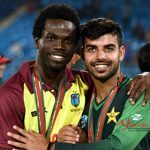 Mohammed Amir and Shadab Khan lead the wicket-takers with 5 each, while the leading wicket-taker for the Windies was Rayad Emrit who nabbed three wickets.